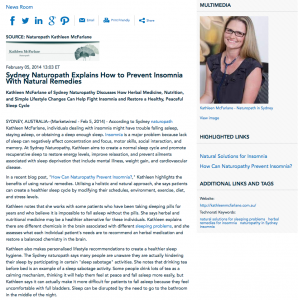 Kathleen McFarlane of Sydney Naturopathy discusses how herbal medicine, nutrition, and simple lifestyle changes can help fight insomnia and restore a healthy, peaceful sleep cycle. Sydney, AU – According to Sydney naturopath Kathleen McFarlane, individuals dealing with insomnia might have trouble falling asleep, staying asleep, or obtaining a deep enough sleep. Insomnia is a major problem because lack of sleep can negatively affect concentration and focus, motor skills, social interaction, and memory. At Sydney Naturopathy, Kathleen aims to create a normal sleep cycle and promote recuperative sleep to restore energy levels, improve relaxation, and prevent ailments associated with sleep deprivation that include mental illness, weight gain, and cardiovascular disease. In a recent blog post, “How Can Naturopathy Prevent Insomnia?,” Kathleen highlights the benefits of using natural remedies. Utilising a holistic and natural approach, she says patients can create a healthier sleep cycle by modifying their schedules, environment, exercise, diet, and stress levels. Kathleen notes that she works with some patients who have been taking sleeping pills for years and who believe it is impossible to fall asleep without the pills. She says herbal and nutritional medicine may be a healthier alternative for these individuals. Kathleen explains there are different chemicals in the brain associated with different sleeping problems, and she assesses what each individual patient’s needs are to recommend an herbal medication and restore a balanced chemistry in the brain. Kathleen also makes personalised lifestyle recommendations to create a healthier sleep hygiene. The Sydney naturopath says many people are unaware they are actually hindering their sleep by participating in certain “sleep sabotage” activities. She notes that drinking tea before bed is an example of a sleep sabotage activity. Some people drink lots of tea as a calming mechanism, thinking it will help them feel at peace and fall asleep more easily, but Kathleen says it can actually make it more difficult for patients to fall asleep because they feel uncomfortable with full bladders. Sleep can be disrupted by the need to go to the bathroom in the middle of the night. Some people read emotionally disturbing material before bed, says Kathleen, and this can cause troubling dreams, leading patients to wake up in the middle of the night, interrupting a deep sleep. Others leave the television, tablets, laptops, and various types of electronic devices with bright lights on as they go to bed. The lights can affect the sleep hormone, melatonin, which lets your body know it is time to go to sleep as it gets darker at night. Kathleen says the unnatural bright lights of electronic devices in your bedroom trick your body into believing it is not yet time to go to sleep. Kathleen McFarlane has studied herbal and nutritional medicine for more than a decade. She offers a number of evidence-based nutritional medications and holistic healing plans designed to help her patients make dietary and lifestyle adjustments to achieve optimum health. Kathleen McFarlane is available for interview upon request. For more information about Kathleen McFarlane and Sydney Naturopathy, please visit kathleenmcfarlane.com.au.